Rio Grande do Norte (lit. "Great Northern River", in reference to the mouth of the Potenji River, [ɦi.u ˈɡɾɐ̃di du ˈnɔhti̥]) is one of the states of Brazil, located in the northeastern region of the country, occupying the northeasternmost tip of the South American continent. Because of its geographic position, Rio Grande do Norte has a strategic importance. 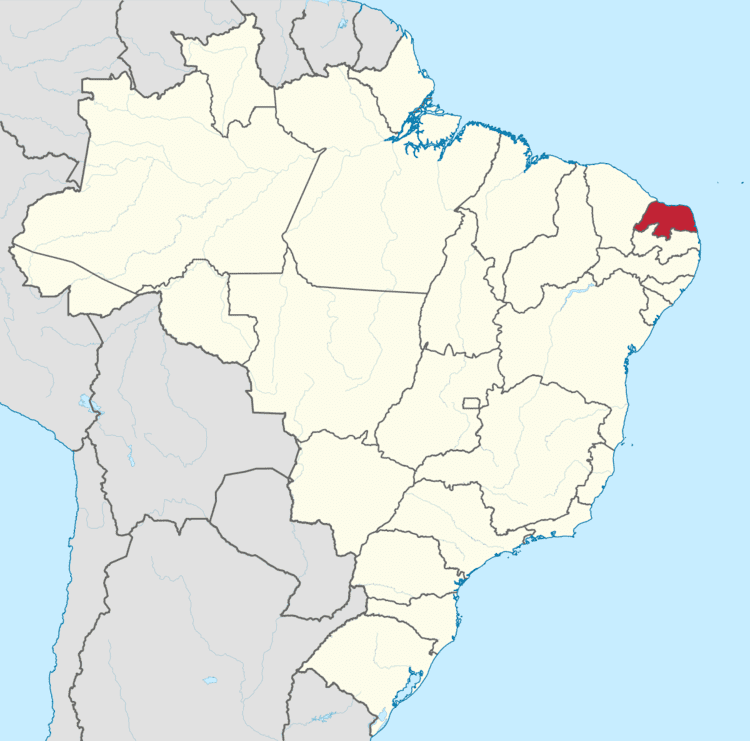 The capital and largest city is Natal. It is the land of the folklorist Luís da Câmara Cascudo and, according to NASA, it has the purest air in the Americas. Its 410 km (254 mi) of sand, much sun, coconut palms and lagoons are responsible for the fame of beaches. Rocas Atoll, the only such feature in the Atlantic Ocean, is part of the state. The main economic activity is tourism, followed by the extraction of petroleum (the second largest producer in the country), agriculture, fruit growing and extraction of minerals, including considerable production of seasalt, among other economic activities. 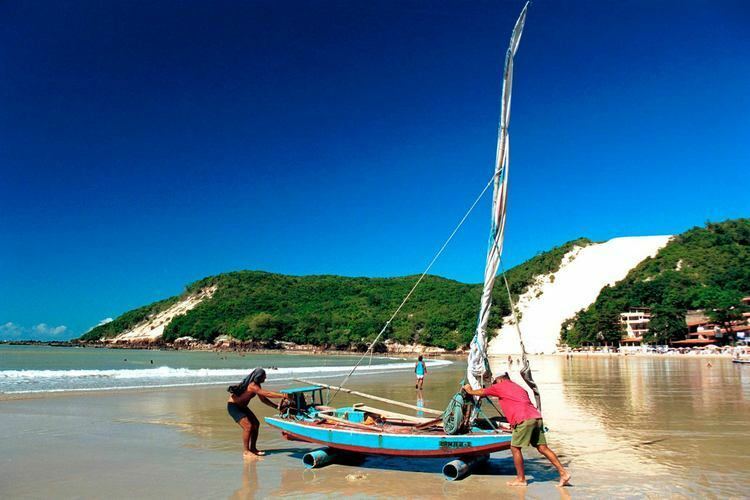 The state is famous for having many popular attractions such as the Maior cajueiro do mundo (world's largest cashew tree), the dunes and the dromedaries of Genipabu, the famous beaches of Ponta Negra, Maracajaú and Pipa's paradise, the Carnatal the largest off-season carnival in Brazil, the Forte dos Reis Magos is a sixteenth-century fortress, the hills and mountains of Martins, the Natal Dunes State Park the second largest urban park in the country, and several other attractions. The state is also closest to the archipelago of Fernando de Noronha. Rio Grande do Norte is dominated by its coastline. The state is famed for its beaches and sand dunes, and the air is, according to NASA, the second-cleanest in the world after Antarctica. Two climates predominate: humid tropical, in the oriental littoral, and semi-arid, in the remaining (most part) of the State (including the North coast). The rainforest which once covered most of Brazil's coast had its northern end in the south of Rio Grande do Norte; the area north of Natal, the capital, is under dunes, a kind of formation associated with semi-arid climate. The semi-arid climate is characterized not only by the low level but also the irregularity of rainfall; some years can go by with no or very little rain; most of the interior of the State is part of the Polygon of Droughts (an area which receives special attention from the federal government). There are also many mangroves in the state, and the interior is dominated by rainforest. Rocas Atoll in the Atlantic Ocean, 260 km Northeast of Natal, also belongs to the state of Rio Grande do Norte. It is contained in the fully protected Atol das Rocas Biological Reserve. The first European to reach the region may have been the Spaniard Alonso de Ojeda in 1499. The northeastern tip of South America, Cape São Roque, 20 miles (32 km) to the north of Natal, was first officially visited by European navigators in 1501, in the 1501–1502 Portuguese expedition led by Amerigo Vespucci, who named the spot after the saint of the day. The Vespucci expedition also named the Potengi (Tupi for "River of Shrimps") river, whose considerably large mouth contrasted with the nearby bodies of water, "Rio Grande" (Portuguese for "Great River"), after which the Captaincy, Province, and State were named. For decades thereafter, no permanent European settlement was established in the area, inhabited by the Potiguar tribe. In the 16th century (between 1535 and 1598), it was explored by French pirates in search for brazilwood. In 1598, the Portuguese built the Forte dos Reis Magos and, in the following year, founded the city of Natal. Rasing cattle and sugarcane plantation lifted the local development and economy. In 1633, the area became a battleground between the expansionist Portuguese, seeking to take more land for their Brazilian territories, and the Dutch, who gained a foothold in South America. After a short period of peace and prosperity in Olinda and Recife, the sugar prices went down in the market of Amsterdam and the region entered into a serious economic crisis. The economic problems led the Portuguese settlers and native Brazilians to revolt against the Dutch in what is known today as the massacres of Cunhaú and Uruaçu. The religious confrontations (the Portuguese-Brazilian Catholicism and the Dutch Calvinism), Portugal's restoration of the throne in 1640 and the reconquest of Maranhão in 1643, lead the Portuguese-Brazilians to undertake the 1645 uprising, led by André Vidal de Negreiros and João Fernandes Vieira. The governor of Bahia promised new Portuguese troops, but most of the rebels were Africans and Amerindians. In 1654, the Dutch were finally cast out. During World War II, Rio Grande do Norte was used as an Allied airbase from which to launch air raids on German-occupied North Africa. In 1964, Latin America's first space launch site was constructed in Rio Grande do Norte; Barreira do Inferno (Hell's Barrier), which was often referred to as the "Brazilian NASA". The Brazilian Institute of Geography and Statistics estimates that the population of Rio Grande do Norte was 3,168,133 on December 1, 2010, a 14.3% increase since the 2000 census. Multiracial people make up 52.48% of the total population. 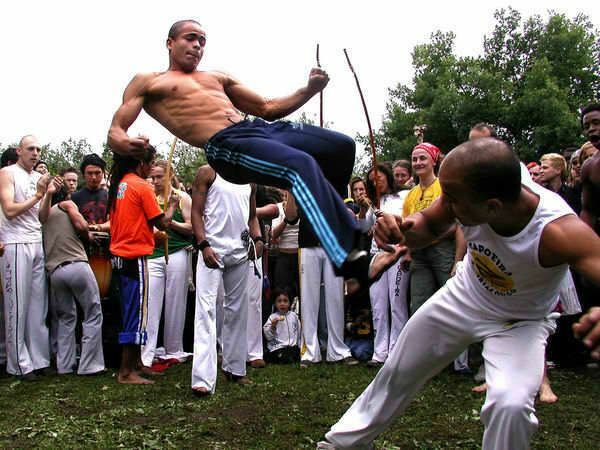 The second largest group composed by white people was 41.15% of the total population, following by black people (5.24%), Asian people (1.04%) and indigenous people 0.08%. 77,916 Migrants arrived in the state between 2000 and 2010, while 71,287 people left the state between 2000 and 2010. Vehicles: 930,857 (Jan 2014); Mobile phones: 1.6 million (April 2007); Telephones: 399 thousand (April 2007); Cities: 167 (2007). The service sector is the largest component of GDP at 50.2%, followed by the industrial sector at 44.2%. Agriculture represents 5.6% of GDP (2004). Rio Grande do Norte exports: fish and crustacean 30.5%, fruits 19.3%, woven of cotton 12.3%, petroleum 10.8%, cashew 8.5%, sugar 5.3%, chocolate 3.9%, sea salt 3.7% (2002). Historically, Rio Grande do Norte has relied upon sugar and cattle for its livelihood. However, since the 1980s, the state government has realised that tourism is a lucrative industry, and more money is being poured into the construction of tourist resorts, and restoring colonial buildings in major cities. Fruit is also grown in Rio Grande do Norte, with the state supplying 70% of Brazil's melons, and the state is famed for its mango and cashew fields. The world's largest cashew tree is located in the state; it has a circumference of 500 metres and occupies an area of 7,300 cm², making it 70 times the size of average cashew trees. Rio Grande do Norte is also one of three Brazilian states that together produce the world's entire supply of carnauba wax. Festa Junina was introduced to Northeastern Brazil by the Portuguese for whom St John's day (also celebrated as Midsummer Day in several European countries), on 24 June, is one of the oldest and most popular celebrations of the year. Differently, of course, from what happens on the European Midsummer Day, the festivities in Brazil do not take place during the summer solstice but during the tropical winter solstice. The festivities traditionally begin after the 12 June, on the eve of St Anthony's day, and last until the 29th, which is Saint Peter's day. During these fifteen days, there are bonfires, fireworks, and folk dancing in the streets. Once exclusively a rural festival, today in Brazil it is largely an urban festival during which people joyfully and theatrically mimic peasant stereotypes and clichés in a spirit of jokes and good times. Typical refreshments and dishes are served. It should be noted that, like during Carnival, these festivities involve costume-wearing (in this case, peasant costumes), dancing, heavy drinking, and visual spectacles (fireworks display and folk dancing). Like what happens on Midsummer and St John's Day in Europe, bonfires are a central part of these festivities in Brazil. According to research by Fundação Dom Cabral, Rio Grande do Norte is the second state with the best infrastructure in the Northeast Region and ninth in the country. Augusto Severo Airport has ceased to be Greater Natal International Airport since summer 2014. The new airport, situated outside the city, is in São Gonçalo do Amarante. Located virtually at sea level (169 ft), with favorable weather and geographic conditions, Augusto Severo International Airport in Parnamirim is 18 kilometers from Natal (RN). It takes its name from Augusto Severo de Albuquerque Maranhão, a native son of that state who died in an accident in France in 1902. The airport has a total area of 11.3 thousand square meters and capacity for 1.2 million passengers a year. The installations and passenger terminals are air conditioned with equipment that can put out 630 tons of cooled air. With an area of 5.5 million square meters, the airport complex operates with 16,482 square meters of passenger and cargo terminals and administrative and maintenance installations. There are 6,224 meters of runways and 61.5 square meters of apron space, providing connections from the greater Natal region to the main centers of the world. The airport is the only one in the Northeast Region to receive charter flights from Scandinavia. The Port of Natal is specialized in cold storage cargo such as fruit, fish and shrimp, among others. It has its own customs facilities and is connected to Europe by direct navigation lines, mainly to the ports of Vigo, Rotterdam and Sheerness. 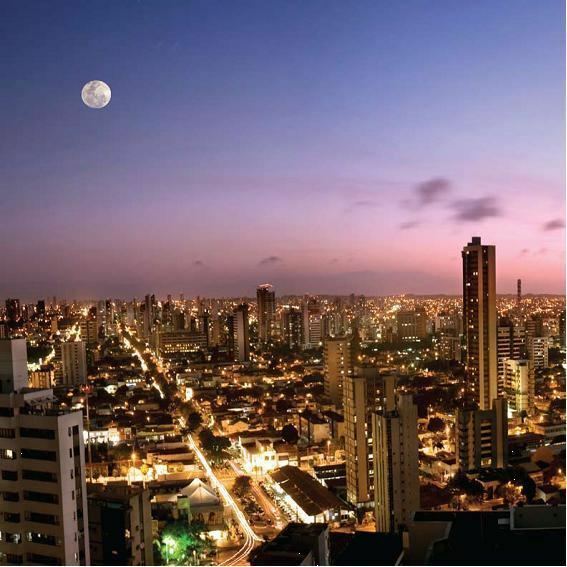 Natal, the capital of state, was one of 12 cities to host games of the 2014 FIFA World Cup held in Brazil. The three main football clubs in Natal are ABC, Alecrim and América Futebol Clube. ABC and America are the biggest rivals, and their match is often referred as Clássico Rei (King Classic). The flag of Rio Grande do Norte was adopted on 3 December 1957. It is based on a design by Luís da Câmara Cascudo. 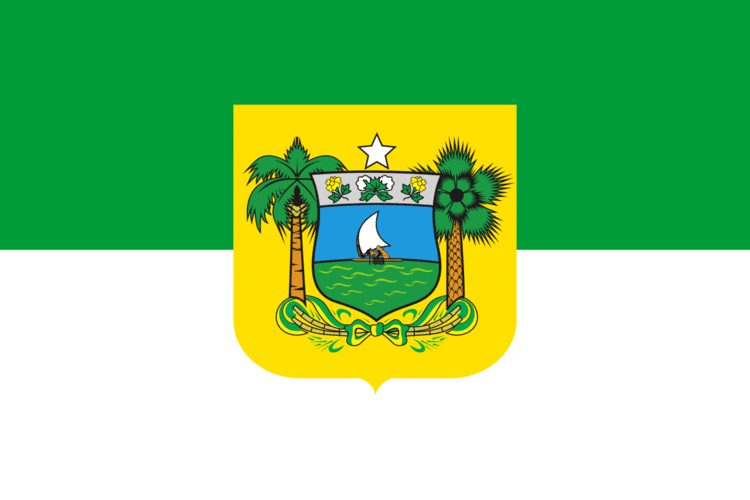 In the middle of the flag is the coat of arms of the state, which was adopted on 1 July 1909. It shows a sailing boat at the coast in the middle, representing the fishing and salt industries. Above it is a bar which shows two flowers on the sides and two cotton bolls in the center. To the sides of the shield are a coconut palm to the right and a carnauba palm to the left, connected by two branches of sugar cane. The star above represents the state as part of Brazil.